After soaring 40% by August, why did Realty Income finish the year up just 11%? 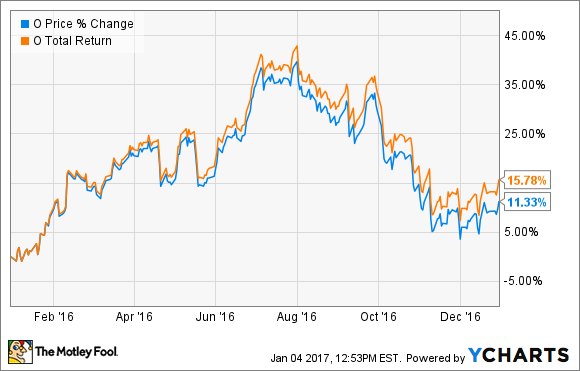 Freestanding retail real estate investment trust Realty Income (NYSE:O) climbed by 11% in 2016. When accounting for dividends, the stock's total return for the year was about 15%, making 2016 a pretty strong year for the company's investors. The real question should be: Why was Realty Income only up by 11% at the end of 2016? In fact, Realty Income peaked at more than $70 last year before a major pullback. Over the first seven months of 2016, Realty Income's share price soared by 40%. While a drop of more than 20% over the latter five months of the year may sound like cause for concern, don't worry about Realty Income's business -- it's doing just fine. In fact, the company had a strong year business-wise, especially in terms of growth through acquisitions. The original acquisition target of $750 million for the year was raised in every quarterly report and ended up being doubled, thanks to cheap borrowing and favorable equity financing opportunities. In a nutshell, the reason Realty Income (and most other REITs) pulled back is because of rising interest rates. Toward the middle of the year, it gradually became more apparent that the Federal Reserve was getting close to a rate hike, which was the initial cause for the pullback. The November election of Donald Trump as the next U.S. president further amplified the market's expectations of interest rate growth over the coming years, and after a post-election dip, Realty Income has since recovered somewhat but is nowhere near its 2016 high. As I've written before, Realty Income is a relatively safe business with the potential to produce market-beating returns over the long run. And I view any weakness in the stock's price as an excellent buying opportunity for long-term investors. Now, it's important to mention that it's entirely possible for interest rates to go up even faster than expected, which could send Realty Income's stock price down even more. However, those with a long-term mentality shouldn't be too concerned -- Realty Income has performed well during past periods of rising rates, and there's no reason to think this time will be any different.